File management isn’t the sexiest area of smartphone ownership — but if you use your device for productivity, it’s an important subject to consider. Your phone, after all, is your on-the-go connection to the world. It’s basically the new PC. And whether your work involves presentations, PDFs, Word documents or images, you’re bound to find yourself fumbling around with files on your pocket-sized screen sooner or later. With the right tools, though, dealing with files from your phone doesn’t have to be a hassle. And the good news? Android’s got plenty of outstanding options. These are the best, organized by what they’ll help you accomplish. 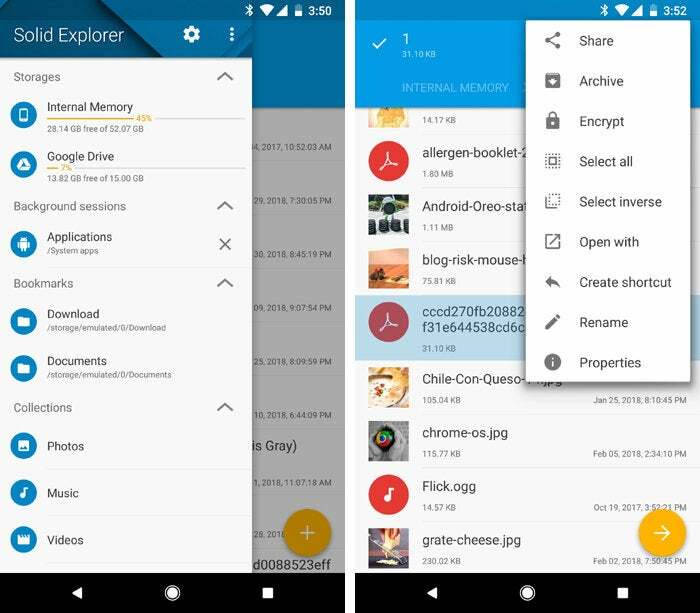 Android file managers are a dime a dozen, but Solid Explorer stands out from the pack with its impressive blend of intuitive design and powerful features. It’s jam-packed with useful stuff, in other words, but still simple and pleasant to use. At its core, Solid Explorer is basically a file browser — a way for you to look through your device’s local storage and open or manipulate items as needed. You can cut, copy and paste files; move files in or out of folders; rename files and folders; and search throughout your device. And, of course, you can share files directly from the browser to any other app on your phone. Solid Explorer can even filter your files by category so you can see all of your images, videos or audio files together — regardless of where they’re stored or what app they might be associated with — in a single spot. Solid Explorer makes it easy to manage your storage — both local and cloud-based — and to manipulate files in any way you need. Some of Solid Explorer’s more advanced features include the ability to zip and unzip collections and the option to add an extra layer of password- or fingerprint-based encryption to any folder or file. And beyond just local storage, Solid Explorer is able to integrate with a wide variety of internet-based storage services — places such as Dropbox, Google Drive, Microsoft OneDrive or your own private server — and then serve as a streamlined interface for managing all of your stuff and transferring data between different locations with ease. If you flip your phone into its horizontal orientation, the app will even give you two side-by-side panels for fuss-free dragging and dropping. Solid Explorer is free for 14 days, as a trial, and then requires a $1.99 in-app purchase if you want to keep using it. Ever find yourself needing to beam a screenshot from your phone to your computer? Or maybe fire off a PDF from your laptop to your phone? When it comes to speedy wireless transfers between any set of devices, Pushbullet is the tool you need. With the Pushbullet app on your Android phone and the platform-appropriate app on any other devices you use — Android, iOS, Windows or any computer with Chrome, Firefox, Safari or Opera installed — you can zap files from one device to another with next to no effort. All you do is share the file from your phone to Pushbullet, then tap the device you want. Seconds later, it’ll show up on that device. Sending a file from a computer to your phone is similarly simple. With the Pushbullet browser extension, for instance, you just click the Pushbullet icon, make sure your phone is selected as the destination, then choose whatever file you want from the local hard drive and click the send button. If Pushbullet is opened as its own window, you can even drag and drop files directly into it. 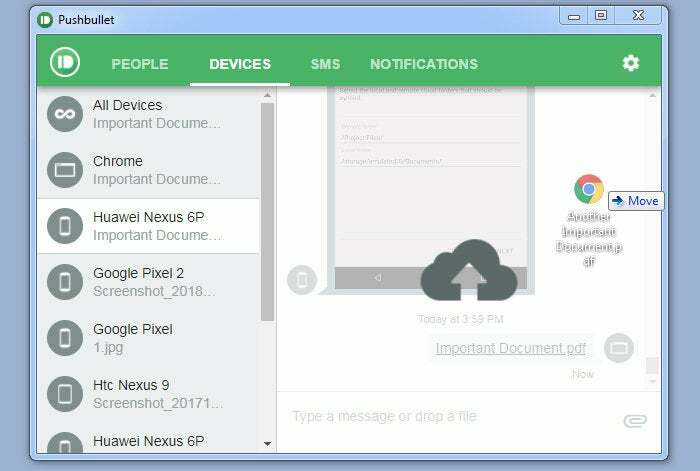 You can beam files from your computer to your phone by dragging and dropping them into the Pushbullet extension. As long as the files you transfer are under 25MB apiece, Pushbullet is free to use without any ads or restrictions. If you need to transfer files larger than 25MB, the service has a pro-level plan with a 1GB size limit and access to other cross-device syncing features for $40 a year. Got specific folders you want to keep synced between your phone and the cloud? Then FolderSync Pro is the program for you. FolderSync lets you pair folders on your phone with equivalents on all sorts of internet-based storage services — public cloud services such as Dropbox, Google Drive or OneDrive; server-oriented providers such as Amazon S3, Go Daddy or OwnCloud; or even your own private server via WebDAV or FTP. You can set up syncs to be one-way or two-way and to happen at any interval you like. You can even create filters to exclude certain types of files (or to include only files that meet specific conditions). FolderSync makes it simple to keep local folders synced with the cloud. 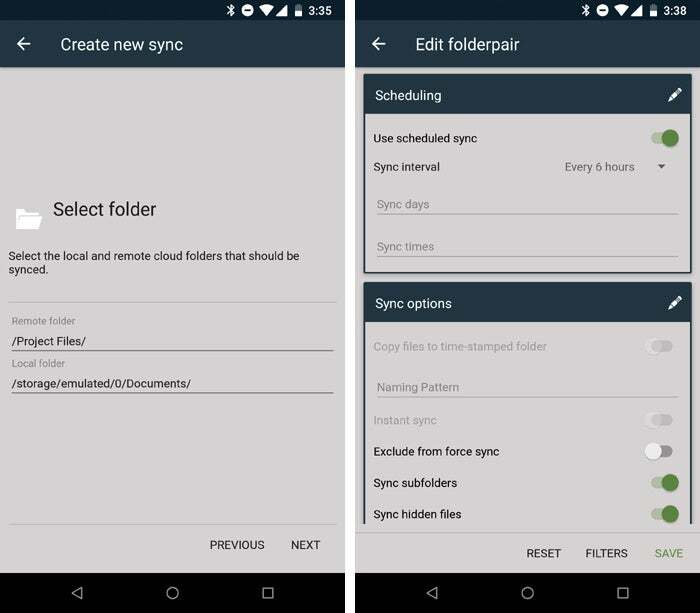 Once set up, FolderSync effectively makes your phone’s local folder and the associated cloud folder one and the same, without any ongoing thought or action on your behalf — and that’s some powerful peace of mind to have. FolderSync Pro is $2.99. A free “lite” version is also available, though it lacks the filtering option and also has obtrusive ads peppered throughout the configuration process. A phone’s local storage is finite — and with all the apps, documents, music, videos and other types of files you download and create, it’s all too easy for that space to be eaten up over time. So how can you keep your device from running low without running yourself ragged? Google’s free Files Go app is the fuss-free answer. The app continuously analyzes your storage and then offers intelligent suggestions for ways you can free up space — by removing things such as duplicate files, temporary app files or particularly large files, for instance. It works seamlessly with Google Photos and will prompt you to remove local copies of any images or videos that are already backed up to the cloud. It will even look for apps you haven’t opened in numerous weeks and suggest uninstalling them to clear some room. 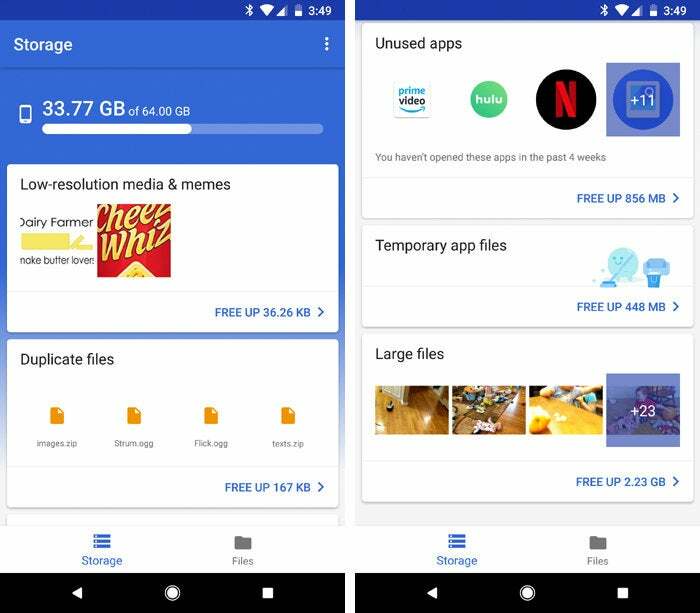 Google’s Files Go app does all the heavy lifting to keep your phone from running out of storage. Files Go won’t do anything you don’t want it to, but it will provide ongoing suggestions for ways to keep your phone’s storage in check. If you ever want to act on them, all it takes is a couple quick taps.